Most Americans in those top tax brackets take large mortgage interest deductions, thereby significantly lowering their federal adjusted gross income. This and other deductions available in the US but not in the UK would push those lines much further apart. 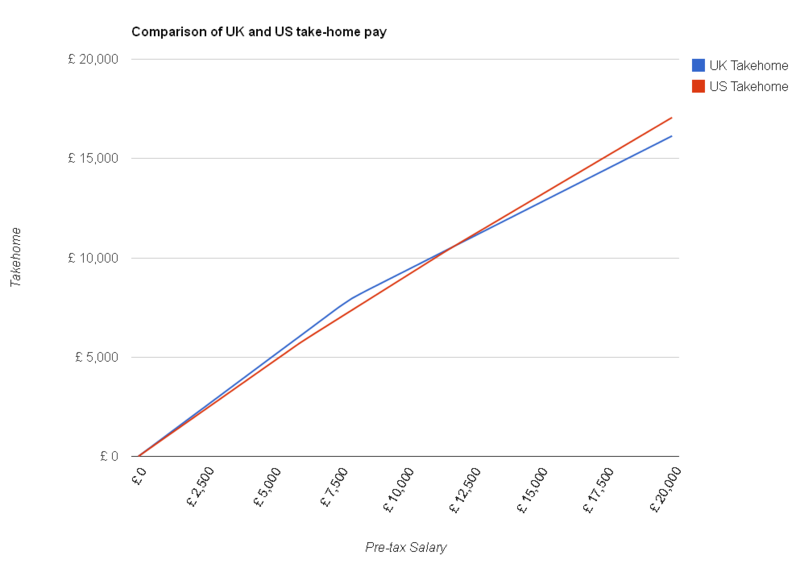 As a Brit living in the US now I can confirm that my takehome pay is significantly higher here than it would be if I earned the same salary back home. Plus I live in Texas so there’s no additional state tax to pay, my company provides excellent health insurance, and the company pension plan + 401K actually adds up to more investment in my retirement than the company pension plan I left in the UK. I guess I’ve been lucky on the benefits package I receive as I know a lot of others in the US don’t get anywhere near the health or retirement benefits I do. None of these benefits every truly outweigh the lack of a good cuppa though. I’m a Brit and have lived in US for 34 yrs. I left a job in UK that offered 20 days paid leave and cushy hours. I came here and took various unskilled jobs that had no health insurance and offered one week of UNpaid leave after a year! I was fired from a job for asking for two weeks off to visit UK, saying they couldn’t hold my job open. If you have a degree and a good job with benefits, you will keep more of your money in US. However, if you work less than 40 hours a week at any unskilled or semi-skilled job, you will not receive health benefits, and that’s if they are offered. Americans work long hours and take short vacations and in my opinion do not have as good a quality of life as Brits. I intend to move back one day. Sue Russell. Things have changed here in the UK in the last 34 years dramatically! Unskilled and even semi skilled people are working full time hours plus to get by. Many people here are exempt from benefits and sick pay. I am working around the clock living with people with disabilities which I get free rent..otherwise would need to work 70 plus hours a week hard work. This tax comparison doesn’t look at the problem deeply enough. I employ several English people in the USA. Their standard of living in the USA is massively higher than the level they enjoyed in the UK. 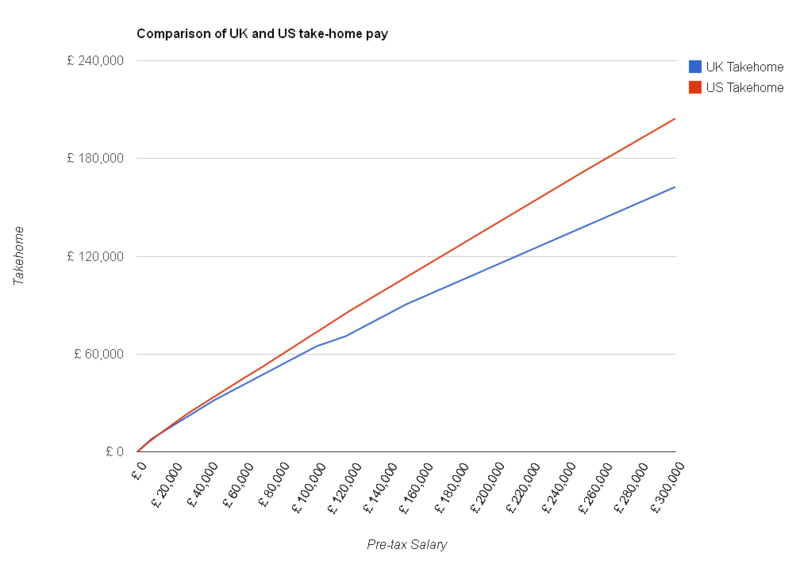 On good salaries, they live as only really wealthy people can in the UK. One lives in a $600,000 property with 10 acres of land 5 minutes from a large town with all amenities. He tells me that his effective rate of income tax in the USA is 11% because of all the permitted deductions. This property would cost over £2 Million in the UK – a sum he could never afford. Another lives in a large $350,000 house that is massively better than the nasty over crowded one bathroom ex-council house he and his family rented in the UK. He told me that the very best thing he ever did was to move to the USA. In the part of the USA where I operate my business, I have met many British people absolutely terrified that their immigration status might change and they would we forced to return to the Socialist paradise that is the UK. I will always pick the UK over the US any day. We have the NHS so I couldn’t care less how much I’m being taxed, I get free health care so tax me as much as you like. But this doesn’t include state income tax. Which 43/50 American states have. The UK has no regional income taxes. The UK does have a regional property tax (council tax) in the UK would fall between 1300USD and 3900USD, depending on the value of your home. Looking at property taxes in the USA, the average payer seems to fall between 1000USD and 3000USD depending on the state. Really if you look at how much better the public infrastructure is in the UK and how much more generous the social spending is, American taxpayers are getting doubly screwed. What the article fails to mention is that state income tax in the US is deductible from your federal income tax and if you happen to live in a state without income tax, you can deduct a certain percentage of your income to offset state sales tax. Property taxes in the US run between 1 and 2 percent of the value of the home and, like many other things, they are deductible from your federal income tax. If you add the cost of health insurance to our income tax, my wife and I pay between 18 and 20 percent on a household income of around $430k (salaries are generally higher here and most goods are cheaper). We moved from Canada about 12 years ago and the difference in our disposable income was crazy. Also as the article described it wasn’t a true deduction. You paid your state taxes on your original salary, then pay federal taxes on your remaining salary. You still get lumped with paying two income taxes. That was the good old days though. Now you get the joy of paying twice with no deductions. Ken-29% plus $400 monthly health insurance employer deduction plus $5000 health insurance deductible. And dont forget real estate tax $300 a month. Total of min $14000 to your 29% oh plus dental insurance plus vision.